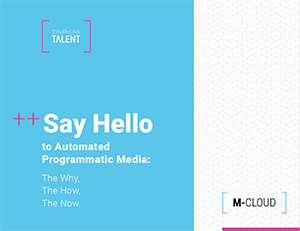 Say Hello to Automated Programmatic Media: The Why. The How. The Now. Automated programmatic is the concept of using A.I.-based technology and proprietary algorithms to buy, place and manage employer branded content and job ads at exactly the right time, to exactly the right candidates, in exactly the right place far faster and with greater precision than any human could ever achieve.